From the moment our section was selected to participate in EUROCLIO’s project “Teaching history that is not yet history” in September, ISHA Belgrade has diligently worked on organizing our local conference. Every week, our work group gathered and discussed about topic of the event and it’s schedule. After all this hard work we were proud to announce that our conference would last three days: from Friday, 24th of November until Sunday, 26th of November, and it will be comprised of series of lecture, movie projections and discussions. The whole event will be happening on our Faculty of Philosophy in the center of Belgrade. The main topic of the conference will be historiography about the war in the ’90, and culture transition of Serbia and Belgrade in that age. 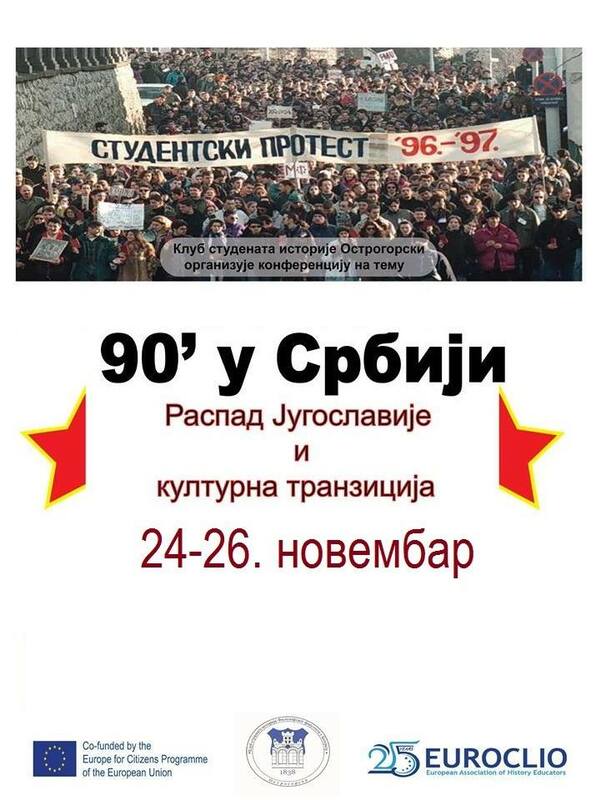 Thus, the title of our conference will be: ’90 is Serbia: The collapse of Yugoslavia and cultural transition. We continued our conference in Saturday with a series of events regarding the topics of: students protests in Belgrade, changes in historiography about the nineties, and the question of writing the common schoolbooks for ex Yugoslavian countries. The last day was “reserved” for culture: there was a round –table discussion about the culture of the nineties in Serbia, and its influence on present day Serbian society.